Goffstown Town Hall is located at 16 Main Street, Goffstown, NH 03045; phone: 603-497-8990. Photo: Saint Anselm College's Alumni Hall, built in 1889, photographed by Ericci8996, en.wikipedia.org, accessed March 2011. Goffstown was incorporated in 1761. 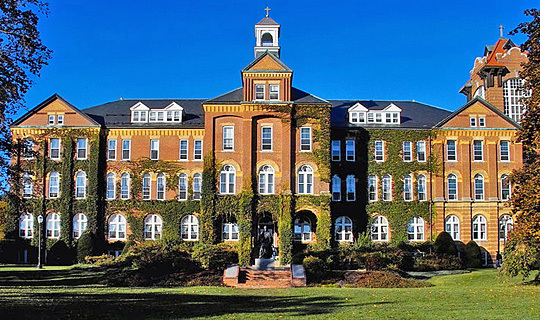 Saint Anselm College in Goffstown, just west of the Manchester City line. It was founded in 1889 by Benedictine monks. The liberal arts college was chartered by the State of New Hampshire in 1895. Goffstown, New Hampshire, once known as Narragansett No. 4, is bisected by the Piscataquog River. The earliest known settler was Joseph Kennedy who cleared land and built a log cabin on the southern side of the Uncanoonuc Mountains. The river and the mountains form two of the most important physical features of the town. The earliest concentration of settlers was in the area now known as Grasmere Village. When Goffstown was incorporated in 1761, all economic, social and governmental activity was conducted from the Grasmere location. As industry began to flourish along the falls of the Piscataquog River, town activity gradually shifted from Grasmere to the West Village, now Goffstown Village. The population grew, factories were built, businesses were opened and housing constructed. Main Street assumed importance in the town as the primary thoroughfare. No great historical events occurred here, no famous architects constructed buildings along Main Street, no birthplaces of the rich and famous are noted, but Main Street, Goffstown chronicles the life and times of a small New England community. Goffstown Historic District Commission, part of Certified Local Government project, "Goffstown Survey Village Main Street — Downtown," www.goffstown.com, accessed March, 2011.